Between the years 1643 and 1649, Princess Elisabeth of Bohemia (1618–80) and René Descartes (1596–1650) exchanged fifty-eight letters—thirty-two from Descartes and twenty-six from Elisabeth. Their correspondence contains the only known extant philosophical writings by Elisabeth, revealing her mastery of metaphysics, analytic geometry, and moral philosophy, as well as her keen interest in natural philosophy. The letters are essential reading for anyone interested in Descartes’s philosophy, in particular his account of the human being as a union of mind and body, as well as his ethics. They also provide a unique insight into the character of their authors and the way ideas develop through intellectual collaboration. Philosophers have long been familiar with Descartes’s side of the correspondence. 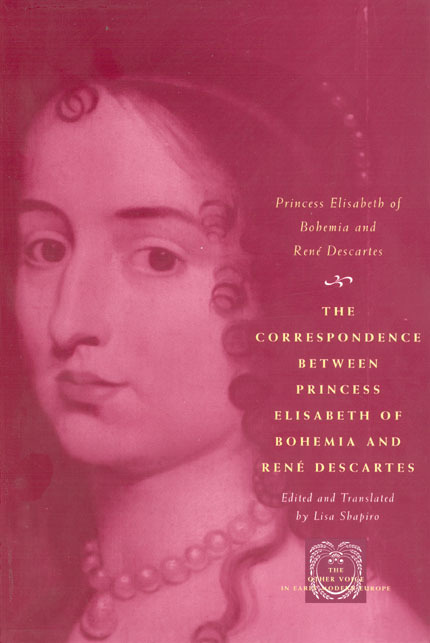 Now Elisabeth’s letters—never before available in translation in their entirety—emerge this volume, adding much-needed context and depth both to Descartes’s ideas and the legacy of the princess. Lisa Shapiro’s annotated edition—which also includes Elisabeth’s correspondence with the Quakers William Penn and Robert Barclay—will be heralded by students of philosophy, feminist theorists, and historians of the early modern period. "Elisabeth’s interests and abilities spanned the entire range of seventeenth-century intellectual inquiry and the New Learning. . . . Scholars have consistently looked to Descartes’s correspondence with Elisabeth to help them understand his theses. These letters engage with the full spectrum of seventeenth-century philosophical thought, with a particular focus on metaphysics, mathematics, political philosophy, and ethics." "Descartes’s correspondence with Elisabeth is among the most important we have for understanding the philosophical thought of a canonical figure. . . . A very welcome addition to existing English editions of Descartes’s works and an important resource for studying early modern philosophy written by women."